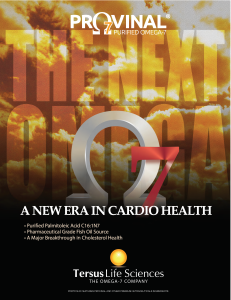 Tersus Pharmaceuticals, a biopharmaceuticals firm in Cleveland, Ohio, developed the science behind Provinal™–an ultrapurified form of Omega 7 (Palmitoleic acid)–that has been shown to possess broad properties for cardiovascular health. CLEVELAND – October 17, 2012 – Dr. Michael Roizen, Chairman of the Wellness Institute at the Cleveland Clinic has joined Tersus Pharmaceuticals–a Cleveland-based Biopharmaceutical company that has commercialized a new heart healthy fatty acid–as Chairman of its Scientific Advisory Board. Tersus Pharmaceuticals has been conducting research & development with Omega 7 Palmitoleic Acid, the next generation of Omega fatty acids that have been shown to possess broad properties to combat diabetes, metabolic syndrome, and atherosclerosis. “This could have a huge benefit for our populations as a whole because metabolic syndrome, insulin resistance, and diabetes are big things we need to tackle for us to be more competitive for jobs, and the United States to be more competitive as a society. We need more studies, but this could really be a great addition—that’s why I joined Tersus Pharmaceuticals—to see if we could get more data on the benefits and risks of purified omega-7.” said Dr. Roizen. Tersus Pharmaceuticals is a Cleveland, Ohio-based Biopharmaceuticals company, the mission of which is to discover, develop and commercialize “nutrients for living.” In early 2010, Tersus Pharmaceuticals was a recipient of Therapeutic Discovery Grant to Support Groundbreaking Biomedical Research. Founded in Cleveland, Ohio in 2010. Recipient of Therapeutic Discovery Grant for Ground Breaking Medical Research in 2010. Provinal™ achieved GRAS Certification in December 2011. Securing the services of the reputable AIBMR Life Sciences, Inc. group to certify that purified palmitoleic acid as Generally Recognized As Safe. Launched Cardia 7 through Basic Organics in February 2012. Provinal™ Purified Omega 7 fatty acids are purified to express high levels (50% and upwards) of palmitoleic acid (C16:1n7). Future concentrations are projected to be 90% or more. Especially formulated to remove palmitic acid, a saturated fatty acid that has been shown to have toxic effects on pancreatic beta cells (the cells responsible for secreting insulin), leading to a greater chance for insulin resistance and subsequent development of diabetes. Note: many, many foods and products contain palmitic acid (it is the main reason nutritionists advise consumers to to avoid foods that are high in saturated fats).